I didn't expect to watch Watchmen. Its trailer was so graphic. The blue-skinned half-naked man with white LED eyes scared me. And I don't recognize any of those DC Comics characters. However, after watching this 162-min movie, I understood why was this sentence printed on the movie poster: From the visionary director of '300'. Director Zack Snyder's most prominent directing style is the portrayal of brutal or action scenes in slow motion - sound, sight, action - all captured tauntingly - perfect. I haven't read the comics. 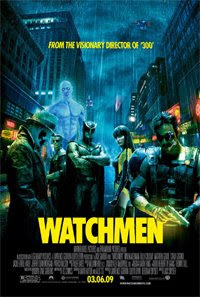 So, I don't have expectations of how Watchmen the movie should be. Should it be based purely on the graphic novel or should it be interpreted in a different way? To me, the most striking point of this movie was the portrayal of the main characters' life - how they began and/or end - in a very thought-provoking way. It wasn't an option for them to become who they were. They looked after the world and its people; but who looked after them? As the movie was coming to an end, I was quite perplexed. Indeed, if the world perishes one day, it's all mankind's fault. One can't blame God. This ideology was clear throughout the entire movie. The atheists might find this point distasteful. 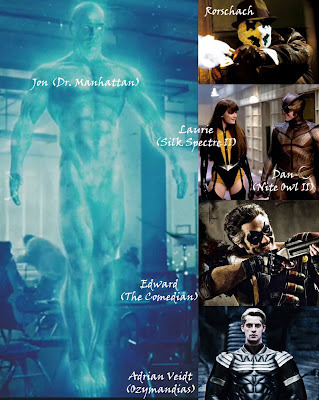 Here's a summarized view of the main characters: Jon (Dr. Manhattan), Rorschach, Laurie (Silk Spectre II), Dan (Nite Owl II), Edward (The Comedian), Adrian Veidt (Ozymandias). If I write a computer program that messes up, is it the programmer's fault or the program's fault? My point of view is that there isn't a programmer anyway. I'm an atheist. I don't find it distasteful that its man's fault if the world comes to an end. On the contrary, THIS is what we believe in. We don't believe that there are some super natural being to blame it on if something good or bad happens. God is really misunderstood if he really exist. The first line that defines genetic programmming as seen in Wikipedia is: "In artificial intelligence, genetic programming (GP) is an evolutionary algorithm-based methodology inspired by biological evolution to find computer programs that perform a user-defined task."